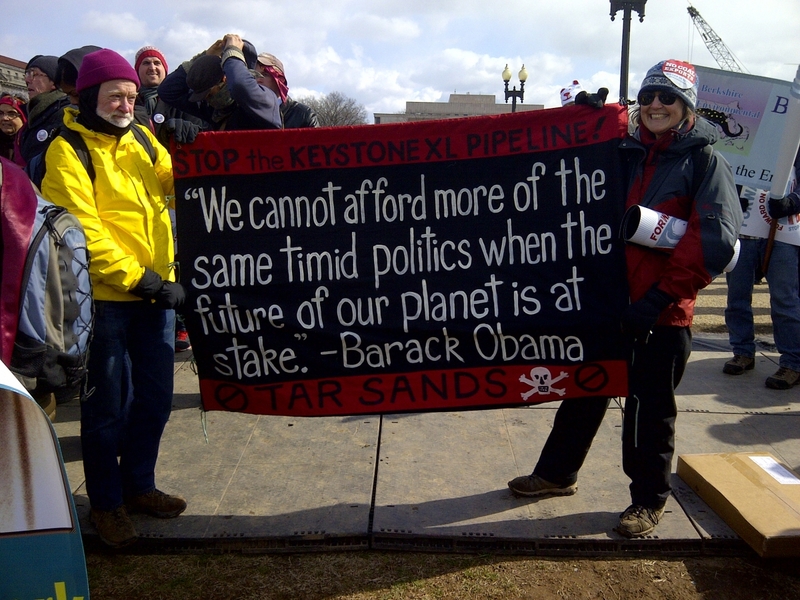 Organizers hope to give Barack Obama political cover to deny the Keystone XL pipeline. Over 35,000 people descended on the National Mall in Washington on Sunday, huddled together against a stinging cold wind to deliver a message of opposition to the Keystone XL pipeline. Their audience was really just one man, the only one with the power to stop the project: Barack Obama. That message of constructive support is evident in the rally’s title, the “Forward on Climate” march, which co-opted the president’s campaign 2012 campaign slogan. The famous Obama “O” from campaign signage is also part of the rally’s graphic messaging, and numerous placards with inspirational quotes from Obama about climate change could be seen in the crowd. Several speakers, including US Senator Sheldon Whitehouse, addressed the crowd before a March to the White House. So this isn’t your standard protest, but rather a rally of support. But organizers aren’t naïve about political realities—and there was some tough talk for the president, too. Van Jones, who worked in Obama’s White House in 2009 as his “green jobs czar,” made it clear in a pre-rally interview that the burgeoning anti-pipeline movement would not be bought off with other initiatives, like tougher EPA rules or more great speeches. Jones continued: “If we lose, we lose everything. We’re fighting for the children of all species. This isn’t just a fight about Democrats versus Republicans in the United States. The children of all species forever are going to be impacted by what we do in this town for the next twelve to twenty-four months. You can watch a livestream of the rally here, and stay tuned to TheNation.com all day for updates. As controversy rages over the Keystone pipeline, senators Bernie Sanders and Barbara Boxer have introdued a 'gold standard' climate change bill, George Zornick writes.